Is your girl sassy or sweet? Or may be she is both! Whatever her personality is, she is sure to love these brand new Ooh La La Couture dresses we just added to the website. Fresh and fun, this cute collection designed for holidays, winter vacations and early spring and features new body styles like a dainty peplum dress, saucy tie bow dress in leopard blush and cheeky tuxedo dress. And let's not forget about the elegant Jenna dress which will make your girl feel like a real princess! Embroidery, animal prints, tulle, ruffles and satin bows come together to create a kaleidoscope of boutique kids dresses that look nothing like the other dresses you will find at the stores. With so many style and colors to choose from, it is difficult to pick just one. Don't know which dress to get for your girl? Here are a few suggestions. For Christmas and New Year, we suggest going with one of Ooh La La embroidered tulle peplum dresses, a tuxedo dress or Devon dress in orchid. All of these dresses are elegant with unusual designs that are sure to put your girl in the spotlight at any party. We also carry a few really cute Christmas-themed Ooh La La Couture dresses from fall 2014 collection. Ooh La La Couture Coco Cardigan Dress in red and Ooh La La Couture Bows Sequin WOW Emma dress in red are perfect for pictures with Santa and holiday card photos. For Valentines day, choose between Ooh La La Couture tie bow dress with hearts or one of stripped twirly dresses with heart applique. We also have a couple of tulle shoulder dresses from fall collection that will make very cute Valentine's Day outfits as well. For birthdays, Jenna dress is a perfect choice. This gorgeous dress with embroidered overlay fabric and large bow in the front will make your girl feel like a princess on her special day! The straps are adjustable to ensure a perfect fit. Ooh La La Varsity Birthday dress is a classic choice. The number in the front corresponds with the size of the dress and is decorated with sparkly sequins. Wiretrim poufier dress in champagne and hot pink are also great for birthdays with their sequin bow design. Click here to shop Ooh La La Couture dresses. 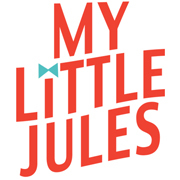 My Little Jules boutique offers free shipping on orders $79+ in the US and Canada which makes most Ooh La La dresses free shipping items. Planning for the future? Take advantage of our Easy Payment Plans and pay only 15% down on the day of your order with 2 to 8 weeks to pay off the rest.